Our dedicated Development Ambassadors raised more than $16,000 in support of the Sacred Valley Project in Peru last year. The project provides a safe living space, nutritious meals, and supplementary education to young women in rural communities in the Andes so that they can avoid the often dangerous and time-consuming journey to and from school, and pursue secondary education with extra support. In 2015, the Sacred Valley Project was able to expand their reach by opening a second facility in Calca, Peru, in addition to the pilot location in Ollantaytambo. 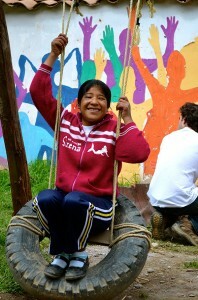 The project now serves girls from 12 different communities in the Sacred Valley. In 2015, the project provided approximately 22 years of education, 15,840 hours of travel saved, 11,880 meals, and 12 jobs for local community members, according to their annual report. “After 6 years working with the Sacred Valley Project, I am still inspired daily by our students and constantly engaged and excited by the many possibilities that our future holds,” says Sacred Valley Project founder and president Alex Ball. Going into 2016, the project was able to expand their services to eight new students, and the students at the Ollantaytambo location are moving to a new, more rigorous local school. Building another dormitory is a major goal for the organization this year. To find out more about the amazing things happening at the Sacred Valley Project, check out their 2015 Annual Report and get updates on Facebook, Twitter, and Instagram.